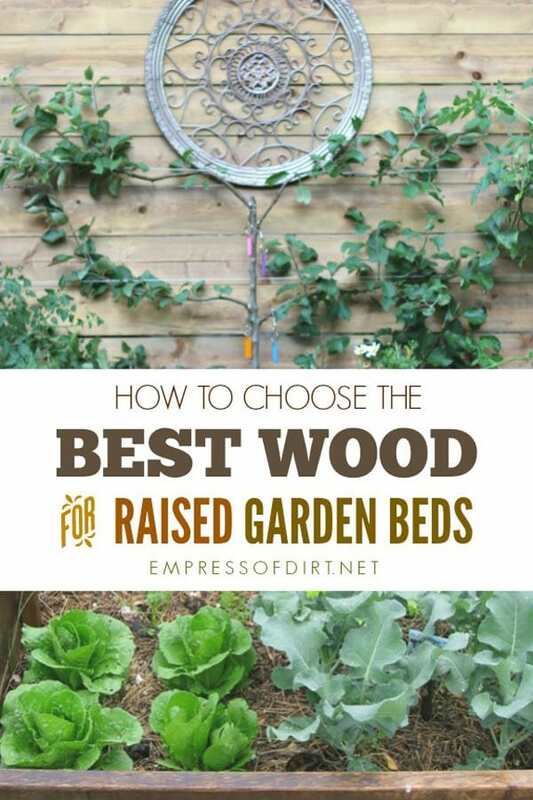 Want to know the best wood for raised garden beds? Raised beds are garden containers, commonly made from wood, and the type of wood we use will determine how long-lasting, safe, and sustainable they are. 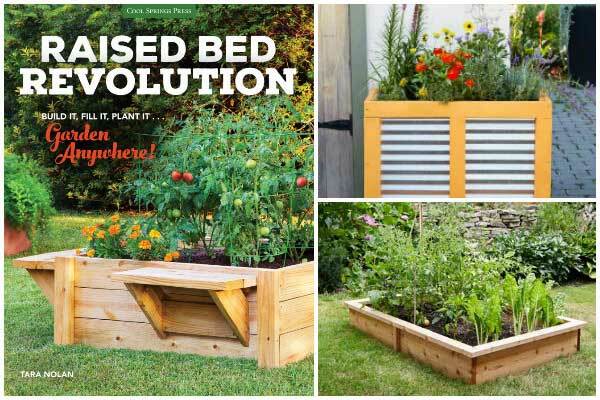 If you are looking for designs, I have free plans for building raised garden beds here and you can find all of the ideas for raised beds here. You’ve got perfect soil, a level yard, consistent rainfall, and everything grows beautifully, right? Every garden has challenges and raised beds can resolve many of them. Bad soil, a sloping yard, and tree roots are all reasons to grow in raised garden beds. A raised growing space is also better for back and knee problems. But what kind of wood should you use? Are some types of wood harmful for the garden? Wood is a popular choice for building plant boxes because it’s fairly inexpensive, readily available, and lasts quite a few years. But you do have to choose carefully to avoid contaminating the soil and ensure your choice is eco-friendly source, affordable, and long-lasting. So, unless you live in termite territory, it’s time to go wood shopping. I built this pond in a raised bed by the front porch in my old garden. 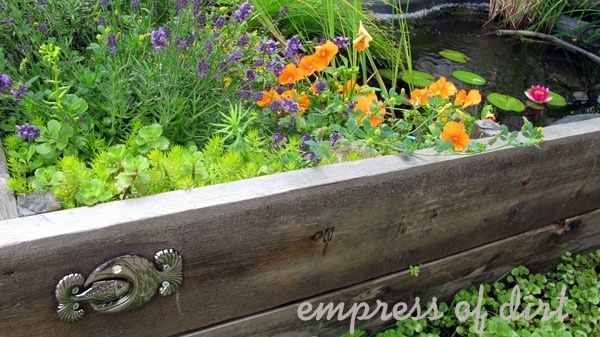 There’s info on how to make your own here: Build a Pond in a Raised Bed. 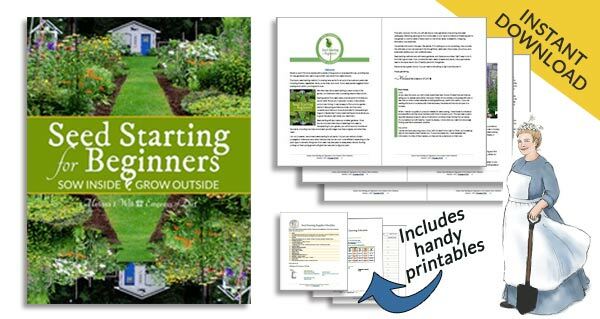 If you want an excellent resource book with plans for building a wide assortment of raised beds and growing containers, this is the book! 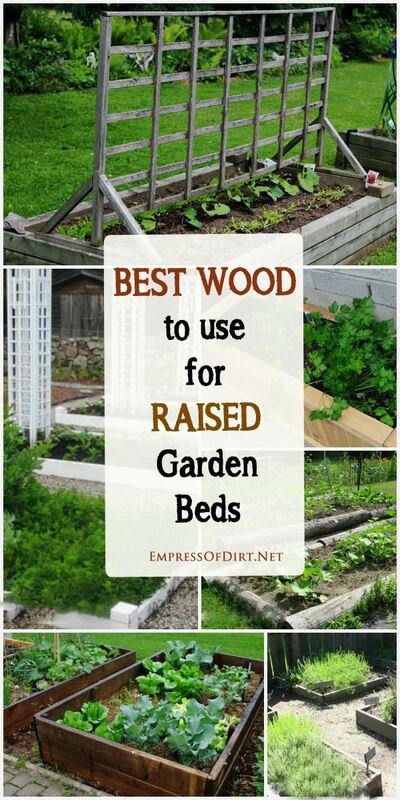 What is the best wood for raised garden beds? Here’s the key traits to look for, then we’ll explore the details. For me, locally-sourced, FSC-certified, untreated, rot-resistant wood makes the most sense. But it is not always possible to check all these boxes. I currently use 1″ untreated pine boards because they are readily available in my area. The wood gets a lovely, rustic barn board patina after just one season. Keep in mind that wood selections vary greatly by region. I admit the suggestions (below) are quite idealistic, but why not do what’s best for the health of your garden and the environment if you can? The best choice (and often the lowest cost) is locally-sourced wood, coming from sustainably-managed tree farms (as opposed to decimating old-growth forest by clear-cutting). If you can, use wood with FSC (Forest Stewardship Council) certification. The FSC is an international, not for-profit organization that promotes the responsible management of forests. If you want to use treated lumber, do your homework first so you’re certain it’s safe for your food garden: not just fence posts and decks. Safety standards and regulations vary by region. I notice some manufacturers now specifically mention if they consider their treated wood safe for vegetable gardens. It’s up to you whether you trust them. What goes in your soil goes in the water, plants, and wildlife, so it’s important to be careful. 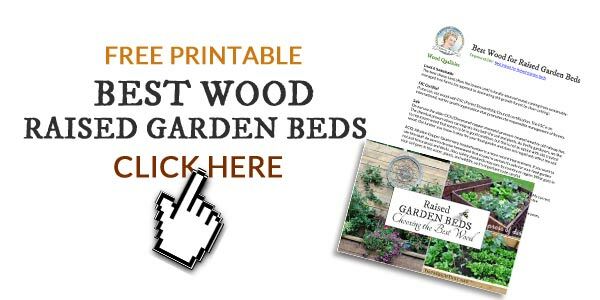 TIP: To be cautious, some gardeners line their treated wood beds with a protective layer of plastic to form a barrier between the wood and soil. Again, you will need to research the plastic to ensure it is food safe and consider the effects of condensation forming between the plastic and the wood. Do not use CCA (Chromated copper arsenate) pressure-treated wood or old railway ties. This method of preserving wood was voluntarily discontinued in the production of residential woods in the United States (2003) and Canada (2004), but it is still used for industrial purposes. The concern is arsenate leaching into the soil and uptake by plants. As thrifty gardeners, we like to repurpose wood that seems to be in good condition, but this is not an option with old, treated wood. How long any wood lasts will depend entirely on the type of wood and local conditions. My current raised beds are made from 1″ untreated pine and last approximately 10 years. But I also live somewhere where the rain is moderate and the drainage is very good.If your raised beds will be exposed to a lot of moisture, wood like pine may only last a few years. Other naturally rot-resistant woods (listed below) will last even longer. I’m sure there’s more than I’ve listed here. Send me a note if you have other good ones to suggest. Recycled or reclaimed wood if you do not know the origin or wood that has been stained or painted. Older (CCA) pressure-treated wood, which is banned in several countries. ACQ (Alkaline Copper Quaternary) lumber is a better alternative. Do your research first to confirm you are comfortable with the exact product you are using. Want to Save or Print this Info? As with any building materials, you must do your own research to make sure the choices you make are safe, eco-friendly, sustainable, and right for your situation. These are ideas to explore, not recommendations. Composite lumber—made from recycled wood shavings. Concrete blocks or bricks—can get quite hot in the sun, but lot of people use them with good results. Do your research first: the old style of blocks (cinder blocks) are not considered safe for gardens although I have not done a lot of research to further check this. Concrete blocks are generally considered fine. But for both, check if fly ash was used and therefore heavy metals could be present. Metal stock tanks —can rust over time. Galvanized culvert or stock tank—may heat the soil too much. Steel – not sure if this is food safe. Old doors—cut lengthwise – be cautious with any paints or stains. Shutters—be cautious with any paints or stains. Railway ties—creosote-soaked ones are not safe. Tires—I know this is fairly popular but I am not convinced it is a soil-safe idea. Paints, stains, finishes—you don’t want them leeching into the soil, so research them first. And, most importantly: watch out for old, lead-based paints. Also check your local library. Good luck with your raised beds! Now go grow something wonderful. How to Make a Fence Taller for Better Privacy | Yes, you can! I bought some criss cross blocks in the garden section of Home Depot. You just add 2x whatever sized boards and I stand garden beds. Then I read your comment about not using cinder blocks n. Now I am worried. Have you ever seen these.? I will try to attack a photo. Will try contacting Home Depot to try to figure out content but not to confident that I will get in touch with anyone that will give me a correct answer. Yes, find out who the manufacturer is and what they are made of. Then research your findings. I’m not an expert by any means and could not advise on it.